Home Faculty Mohan K. Raizada, Ph.D.
Dr. Raizada has been a biomedical researcher and educator for 25 years. He received his Ph.D from the University of Kanpur, India and performed dissertation research at the Central Drug Research Institute, India. After post-doctoral training at the Medical College of Wisconsin, and Lady Davis Institute, Montreal, Dr. Raizada joined the Department of Physiology and Biophysics, University of Iowa as an assistant professor in 1979. He moved to the University of Florida in 1981 as an associate professor. 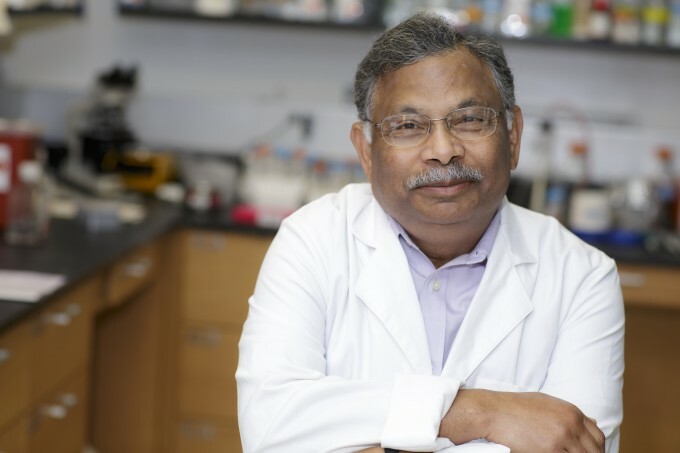 Dr. Raizada is a leader in the field of neural control of cardiovascular functions and has pioneered physiological genomic techniques to investigate the involvement of the renin-angiotensin system in cardiopulmonary disease. His most significant contribution has been the demonstration that angiotensin converting enzyme 2 (ACE2) and vasoprotective axis of the RAS plays a critical role in maintaining a normal cardiovascular homeostasis, and is poised to be a better therapeutic target for the next generation of antihypertensives. Dr. Raizada has published 269 peer-reviewed papers, 44 review articles, edited ten books, and has been and continues to be an invited speaker at national and international meetings. He has received uninterrupted funding for his research program primarily from the NIH. Dr. Raizada is a recipient of numerous prestigious awards including Young Scientist Medal from the Indian National Science Academy, Established Investigator Award from the American Heart Association, Losartan Award from Merck & CO, Outstanding Research Award from Sigma Xi, Florida Chapter, UFRF Professorship, MERIT award from the NIH and Ranbaxy Award for Outstanding Research in Biomedical Science. He has been a regular member of the NIH study sections (ECS, HM, and VCMB) for the last 9 years and is in the editorial boards of many high quality scientific journals. 2015: Dr. Mohan K. Raizada: Lifetime Achievement Award for Faculty in the College of Medicine at the University of Florida. 2014: Dr. Mohan K. Raizada: Carl Ludwig Distinguished Lectureship, presented by the American Physiological Society. 2013: Dr. Mohan K. Raizada: Arthur C. Corcoran Memorial Lecture by the American Heart Association’s Council for High Blood Pressure. This honor is given each year to a distinguished researcher in the field of hypertension. Dr. Ravindra Sharma: Best Abstract, Title “Protective Role of Angiotensin Converting Enzyme-2 (ACE2) in Pulmonary Hypertension”. Dr. Aline C. Oliveira: Best Poster Award, Title “Altered Brain-Gut-Lung Axis in Hypoxia-Induced Pulmonary Hypertension”. Dr. Ravindra Sharma: New Investigator Award, Talk on “Protective Role of Angiotensin Converting Enzyme-2 (ACE2) in Pulmonary Hypertension”. Dr. Aline C. Oliveira: Oral Presentation, Title “Protection against hypoxia-induced pulmonary hypertension in CX3CR1-deficient mice correlates with decreased microglia activation”. Colleen Jeffery: New Investigator Award, Paper on “Genetically Modified Probiotics for Oral 9 Delivery of Angiotensin-(1-7) Confers Protection Against Pulmonary Hypertension”. Yanfei Qi: American Foundation for Hypertension Research and Education (AFHRE) Travel Award, Paper on “Low Dose Minocycline Lowers BP and Improves Inflammatory Status in Patients with Treatment Resistant Hypertension”. Yanfei Qi: Best Poster Award, Title “Hypertension Is Associated With Profound Pathological Changes In The Gut”. Seungbum Kim: Best Poster Award, Title “Butyrate, a Microbial Metabolite, Attenuates Angiotensin II-induced Hypertension and Gut Dysbiosis”. Mohan K Raizada: Invited Speaker, Title “Neuro-immune communication in hypertension: a new therapeutic angle? Seungbum Kim: Travel Grant to present his paper “Microbial metabolite, butyrate attenuates angiotensin II-induced hypertension and dysbiosis”. Seungbum Kim: Best Oral Presentation – Basic Science award for his paper “Microbial metabolite, butyrate, attenuates angiotensin II-induced hypertension and dysbiosis”.